Just like the cheese crackers that you can get from the store, without the extra junk in it. These are baked to an extra toastiness. I love cheese crackers but I never could find cheese crackers that were a tad bit toasty. Other crackers can fall flat in the flavor because they just bake them until crispy and crunchy. I found them at the store but the batches of the crackers are iffy sometimes, they are either not burnt enough or they are too burnt. Also I want my crackers to bigger in size and different punch of flavor, chipotle pepper and pepper. The chipotle pepper gives the crackers a kick of heat and slight smokiness. These crackers are kid-approved, my niece and nephews love crackers and they loved these. They eat them all the time with their lunch. 1. Freeze butter for at least an hour and cheddar cheese for thirty minutes. 2. In a food processor, add 1 cup of flour, 1 stick of cubed butter and half a block of cheese cubed. Pulse together for 10 to 15 time or until pea shape then add the rest of the cheese, flour and butter with salt, black pepper and ground Chipotle pepper then pulse for 10 to 15 times or until gravel like. If you do not have a food processor, you can cut the butter and cheese into the flour with your hands, knife or a pastry cutter. 3. Slowly add water a tablespoon or two at a time until dough is slightly sticking but not too sticky. The dough will still be crumbly but if pressed together will keep its shape. 4. Lay out a layer of plastic wrap or cling wrap. Tip bowl over and shape it into a square and gently press it down evenly. 4. Chill dough in the fridge for at least 2 hours or until dough is firm. 5. Cover two cookie sheets with parchment paper. Divide dough into three section and roll dough out to 1/4 inch then cut 2 by 2 inches. Clean the edges and collect in a ball. Chill Transfer to prepped pan and dock each cracker with a toothpick or fork and chill for 30 minutes. You'll have to cut dough two to three times and make sure to keep the dough chilled. 6. Preheat oven to 350 degrees and bake cracker for 20 to 25 minutes or until extra toasty golden brown but not burnt. 7. Let the crackers cool for 10 minutes then transfer to a wired rack until completely cooled. Store in a ziplock back or airtight plastic container. Will be fresh up to a week. These look delicious! I bet they're a hit at parties and potlucks. Mmmmmm! These crackers look so cheesy and totally yummy! These sound delicious. I am always disappointed with store bought cheese crackers. I'll give these a try. You always have a fun twist on a classic favorite. I would love to try these with a bowl of tomato soup. Oh wow...these are different! I've never seen these before. I bet they go great with a good wine! Yum! I'll give them a try! Thanks! Ohhh these look so yummy - and oh so addicting! Will have to try it out! These sound so good. I love that the ingredient list isn't a mile long and they don't have the extra junk like the store would. A must-try. OMG these look delicious! I love Cheez Its, but they're never toasty enough. Definitely need to try this out! Yummy! I love mine more toasty too! I will definitely have to try this out! These look crispy and delicious! I have wondered how to make before, thanks for sharing! Those crackers look absolutely delicious. Anything with cheese is good! These crackers looks amazing! I too love the idea of making them myself without all the extra stuff that boxed crackers have. Yummy!! These look like an awesome snack. I will be making these. Yummy!! I love toasties and anything cheesy, so this makes me so excited to try out!! These look and sound so delicious, I will definitely have to try these snacks for the family, thanks for sharing! Omg these look SO tasty! What a great little snack that doesn't have all the crap in it from the stores! Love it! This looks so yummy! I love cheese, especially cheddar, and we don't have these crackers in the stores so I will definitelly try these. Thank you for the detailed receipe! Where have these been all my life?! Definitely going to make these! Now that is a cheesy snack. I would really love to bake some of these! Homemade is always best! These look delicious! I absolutely love making crackers from scratch! I'm excited to try out your cheddar cheese crackers recipe. They look so darn yummy! I love how simple and easy this recipe is!! I’m definitely gonna try it out! I’ve been looking for semi-healthy snacks to give my son that doesn’t have all the junk! Thank you! These look like my favorite crackers that are sold here in the Philippines! I'll be able to save a lot with this one. Thank you! These look fantastic and so easy to make!! Thank you for sharing the recipe! Yum I love a toasty cheese cracker too! Plus how great that you know exactly what all the ingredients are you are using, perfect way to make sure they are not hydrogenated oils. I will be pinning this recipe for sure! Oh my goodness those look so yummy! And I know my 2 yr old Will scarf them down... definitely going to make them! These look so yummy! I love the idea of making them homemade so you know whats in them! These sound so good. Simple ingredients also. Oh my gosh these looks so yummy! Would love to dip these in a pipeing hot bowl of Tomato soup! Yum! Your pictures make me drool! Thanks for sharing this recipe. I'm hosting a tea party this weekend and I think they'll love this! I love the idea of adding these for lunches! My youngest loves crackers in his lunch, but I am always concerned about the store bought kind, with all the added sodium and preservatives. Now I can please him and be guilt free! Finally, a recipe that is easy and I can try. And this truly looks yumm. I would have never thought of trying this! So smart. I think my kids would love them! These look very tasty! I am a celiac but I think I could make them gluten free with a flour switch! You had me at crispy and cheese!! Those look amazing!!!! Yum!! I’ve tried making cheese crackers and they never turn out cheesy enough. I need to try this recipe. These are looking good! Plus they are probably a tab bit healthier! Oh, wow! These looks so tasty and amazing! So crunchy! This is so awesome that you can make cheese crackers at home! I hate buying processed food at the store but I love my cheez-its, so I'll definitely have to try these. Oh my gosh these crackers look delicious! Oh these sounds super tasty! We love cheesy cracker and this looks filling, too! What a great idea! I have never thought to make my own cheese crackers before, I will have to try this. Wow! This looks delicious. 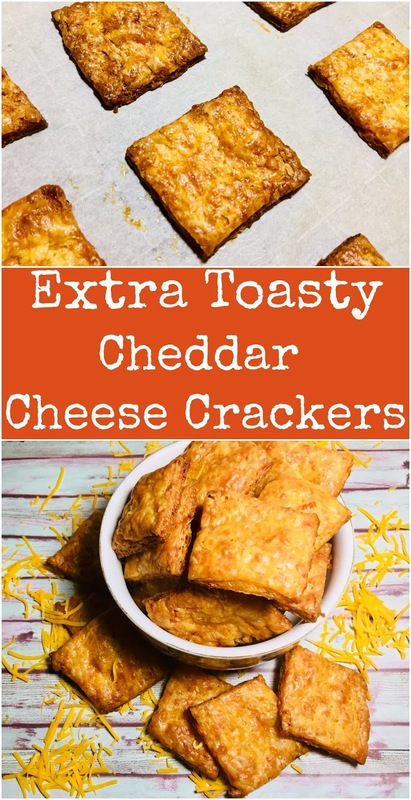 I am a big cheese fan but I have never thought of making toasty cheddar crackers. Would love to try this. This would be a great staple to have in our house.